Disclosure: I received this product from CVapor for review purposes. Click here to check out the options and pricing at CVapor. The eGo ONE comes in two… flavors as it were. There’s a smaller 1100 mAh version with a 1.8ml tank as well as the larger 2200 mAh version that sports a slightly larger 2.5ml tank. My review unit was the larger setup. 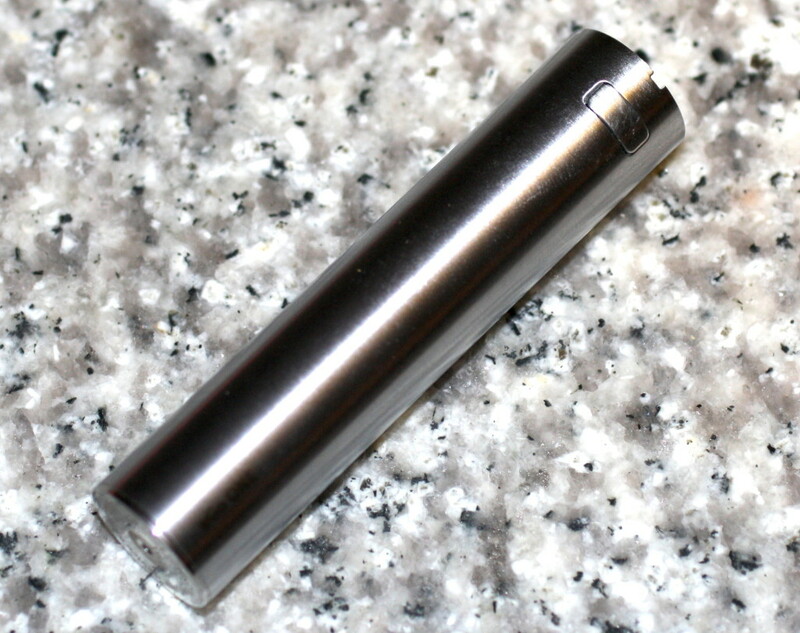 This successor to the storied line of midrange vaping devices has a much more simple appearance than its predecessors. Essentially, with tank and battery connected it appears as a monolithic unit. Gone are the familiar eGo-style battery connectors and backlit clear plastic button. In place of the classic connector is a straight-up flat 510 connector. Thankfully, Joyetech didn’t decide to change over to something proprietary. The button, is still backlit, though it is now a small metal rectangle that protrudes slightly from the body of the battery. A while LED shines behind the button. The LED serves as a somewhat convoluted battery charge indicator. After you press the button to activate the unit and release the button, the light will indicate battery status. A light that stays on for a few seconds indicates a full charge. Slow blinking and then progressively faster blinking indicate a medium and a low charge respectively. The system is a little odd. I prefer the color-coded lights of most Innokin devices. But, it is nice to actually see the lights holding the device comfortably away from your face. Toward the bottom of the device, you’ll find a USB micro connector for charging and pass-through vaping. What you won’t find is any voltage or wattage adjustment dial. Like classic eGo-style devices, the ONE is voltage regulated to around 3.7 volts. Unlike the classic models, you can drive subohm tanks at that voltage. Speaking of tanks, the bundled tank includes two heads. One dials in around 1 ohm while the other is 0.5 ohms. A special note to my YouTube friends: in my video I stated that my heads actually metered in at .9 and 2 ohms. It turns out my meter was defective. The actual measurements I took during this review were 1.1 ohm and 0.5 ohms. eGo ONE tanks are a little on the small side, but are built like many of the popular vertical coil tanks. The entire tank is covered with a steel sheath that features three sets of three slits in the exterior to check up on your liquid levels. Truth be told, it’s a little hard to see in there to gauge the levels, but it does make the tank pretty strong. 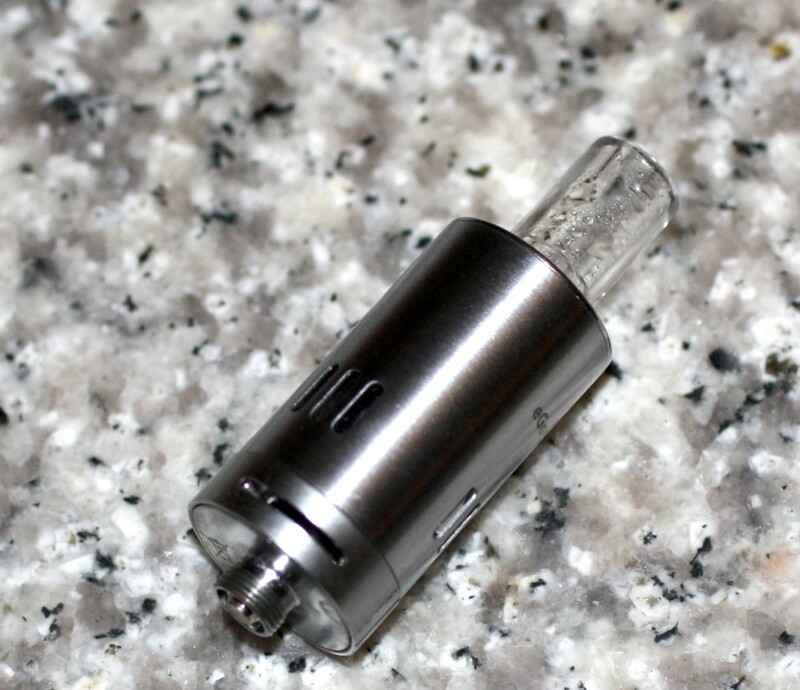 The replaceable heads feature very large coils that are open to the air tube. This large bore ensures a good amount of vapor travels up through the glass or steel tips. A nice touch, you get both with the kit. I prefer the glass as it has a slightly larger bore than the steel tip. At the bottom of the tank, you’ll find the airflow controls. Their design is a fairly common one, there’s two long slits on either side of the base, and a ring with matching slits fits over the base and rotates. Increase or decrease the exposed air channels as you like to adjust the airflow. The action is smooth on the adjustments. It’s also on tightly so there’s not much worrying about the air vents changing size when you look at them funny. As I mentioned earlier, the battery is a fixed voltage model that can handle very low resistance tanks. You lose some of the versatility in having a fixed voltage setup, but that’s made up for by greatly increased simplicity. But, because you can’t make adjustments, the tank sort of makes or breaks a device like this. In that regard, we have a bit of a good news, bad news situation here. First, the good news. I found performance to be delightful with the 1 ohm head. The vapor was warm, thanks to the small tank size and short drip tip. There was plenty of vapor to be had and flavor was great. According to my rough math, my eGo ONE was running at about 14 watts. It definitely put out a lot of vapor for something in that wattage range. If I had to say anything bad about this configuration is that it’s noisy. 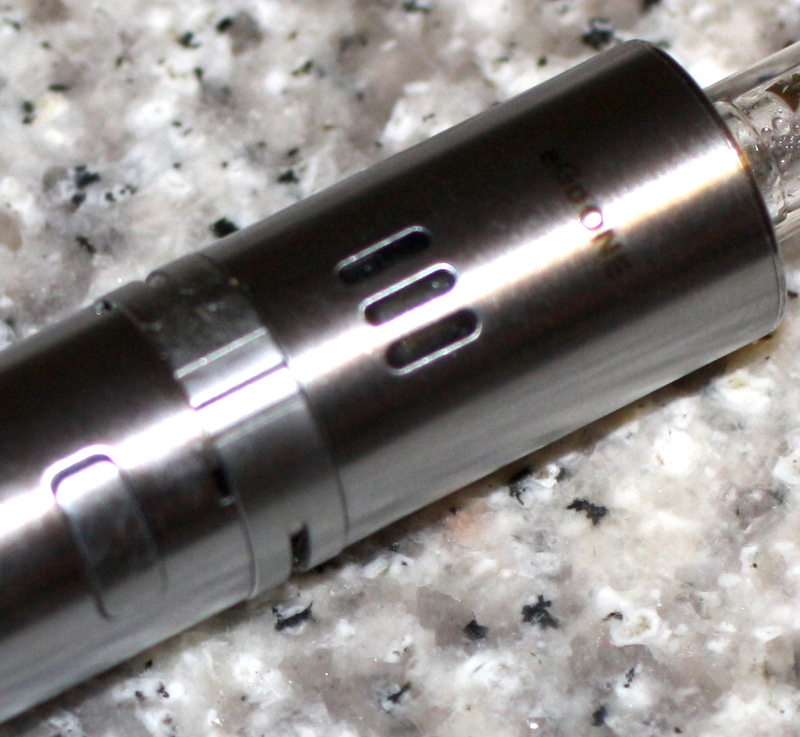 Remember the hiss and pop you’d get from something old-school like a Smoktech cartomizer? Yeah, it kind of sounds like that. For you whipper-snappers out there, if you hear this thing hissing and popping, there’s no need to panic. Now for the bad news. Yes, you probably worked out that I’m talking about the subohm head. Now, that setup actually produces a fabulous amount of vapor, so it’s got that going for it. But, the problem is you have to be pretty slow when you’re using it. 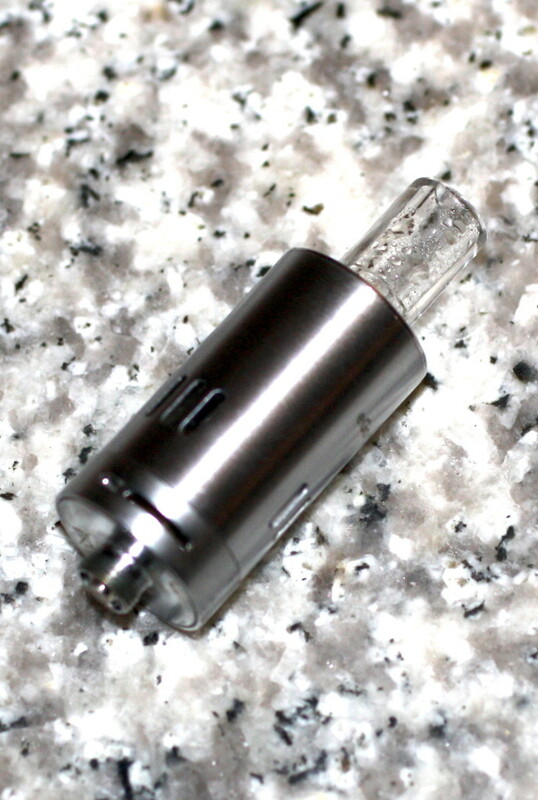 It seems to me that the tank design is simply too small to allow the e-liquid to wick into the head quickly enough. The result is frequent dry hits after just a few decent hits. I don’t care how good the clouds are, if they make you cough like an old-timey Lucky Strikes man, what’s the point? That being said, since the battery has enough power to drive half-ohm tanks, you could always pair it with a more competent tank to get that performance. But, that sort of defeats the purpose, doesn’t it? I’m not saying that this is a bad kit. I thought it works great with the higher resistance head. I just hope that Joye manages to re-work that lower resistance tank. That would make this one hell of a compelling alternative to some of the more advanced devices on the market. For folks who want a little more performance without all the hassle, however. This still is not a bad choice. Now, about that coupon code I teased. CVapor has a 10% off code for this device. Use coupon code JOYETECH15OFF. Yes, I know it seems odd that the 15 off coupon is only good for 10% but just go with it and enjoy some simply advanced vaping. Now, click here to go visit CVapor.